Work on Phase-2 of Namma Metro is a little closer to taking off with the BMRCL inviting tenders for geotechnical investigations for this phase. Three separate tenders have been invited for execution of similar works in three sections of the project. The geotechnical investigation will be carried out on the two extensions of Reach-1 and Reach-2, which are part of Phase-2. Tenders have also been floated for geotechnical testing for a new metro line in phase-2, that is, Reach-5 that stretches between R.V. Road and Bommasandra, a 16-km-long stretch. Soil tests for any infrastructure project are crucial. These tests determine the soil strata and enable designers to design appropriate foundations Reach-5 is going to provide the much needed connectivity to the bustling locations of south Bengaluru. The 16-km network will have 16 stations which include R.V. Road, Raggigudda temple, Jayadeva hospital station, BTM Layout, Silk Board, HSR Layout, Oxford College, Muneshwara Nagar, Chikkabegur, Basapura Road station, Hosa Road, Electronic City, Huskar Road, Hebbagodi and Bommasandra. This line once completed will help decongest areas where a large number of private companies are located, especially Silk Board, which has been a bottleneck all this while. “There are several hundred people who used to travel via Silk Board which connects to important parts of the city like HSR Layout and BTM Layout. The metro network is planned at this strategic location to ensure that people can avail the metro facility for commuting. Also, this line will be connecting to Electronic City which is a major IT- BT hub and a metro link to this location was very important. 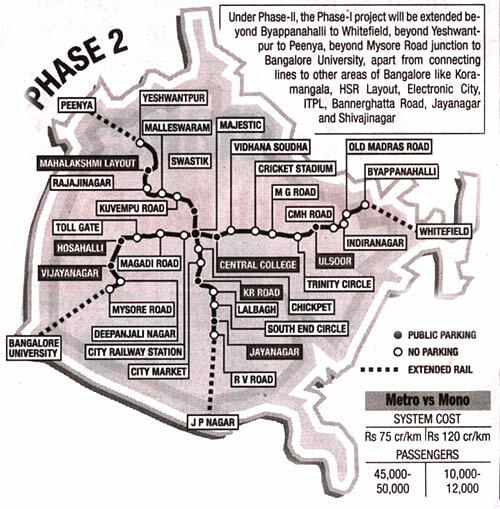 The line will also cover important hospitals like Jayadeva on Bannerghatta Road,” said a senior BMRCL official. Click here for the Phase-2 Map.